Ill be following this thread. I like and use the Sterilite Industrial 15 gallon totes. They are inexpensive, $10, and are the perfect size, in my opinion. I have one that holds all the kitchen stuff, one for food (stack of two beside the fridge), one for recovery gear, one for miscellaneous stuff (stack of two behind the driver's seat). I like the Goose Gear system, but I don't think want a built in system, I like to keep it modular. 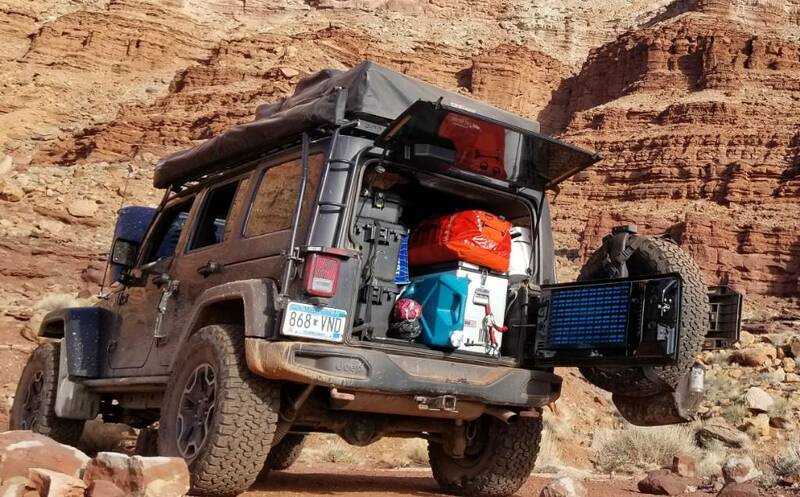 We prefer to not cook out of the Jeep, so having totes light enough to carry to a picnic table is nice. I wish I had a better more recent picture to post, but you'll get the idea. I base camp with a ground tent. Over the years I have used assorted totes (the short ones store under a cot and are easier to find stuff in). Currently I am using 5 Harbor freight Apache cases (3 to 4-3800 and 1-4800) the 3800s also store under a Coleman cot pretty well, the 4800 is for the cook kit and is still being organized. The dry foods are stored in ammo cans as are canned drinkables (on long rough trails canned drinks wear holes in each other in the normal cardboard packaging. Plano boxes. They double as camp chairs. They are pretty light and surprisingly sturdy. You can weather seal the lid in case you plan to keep it outside else you'll get dust all over your stuff. Can't say I've used all the ones already mentioned. I originally used pelican cases, but a few years ago moved over to wolf boxes from front runner outfitters. I like them a lot better. Seems like I can fit more in easier, they are lighter but still strong, the sides are vertical, they stack, they are not so big that they get too heavy individually, and because I bought all wolf and no cub size I can use a series of 3 in a row in the back of the LJ for a place to nap, just put a pad on top and crash. They technically are not waterproof (there is a small hole in the bottom) but I use them inside so not an issue. Really the hole is on the bottom and protected from rain and splashing, more of an issue if the box was submerged. Following this with interest... I've been using a couple rubbermaid totes in the back for a while but I want to start looking for some better kit. Gonna take a look at the HF boxes next time I'm there. There is one walking distance from my place which is good and bad... getting something that can fit my camp stove is going to be the biggest challenge, I feel. We have kind of a big Coleman so fitting that in a box is going to be fun. 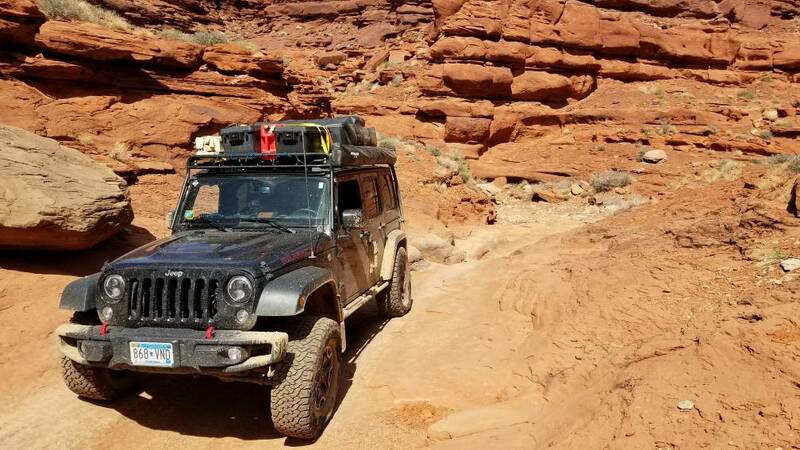 My JKU has a soft top which presents some other challenges for storage of box based things given the hardware for the top... And summer trips where I just run a bikini top and a back window. I really like these. Thank you for the suggestion. I currently have one Dewalt box that I really like. I have like 5 of those bigger size ones we use for different business stuff, along with one of their bigger rolling toolboxes, two of their and a couple of the smaller ones. Been pretty happy with all. I own one of the Front Runner Soft flat packs. I have really liked it. Plano boxes. They double as camp chairs. What size plano boxes are you running? They look like the perfect size. I have all their sizes but the small fits perfect when stacked and fitted the way i have in pic. They have a lip/groove at bottom and cover which makes stacking nice. They fit all my pantry needs, even the classic coleman fits. Also since the rear seats are angled, you can fit a medium at bottom but only small at top but they dont stack as nice. Not a biggie since you'll want to strap them anyway. As you can tell, i love my plano boxes. In this trip i carried 2 medium on the rack and 2 small inside. Yup i'm fixing my overloading disease.